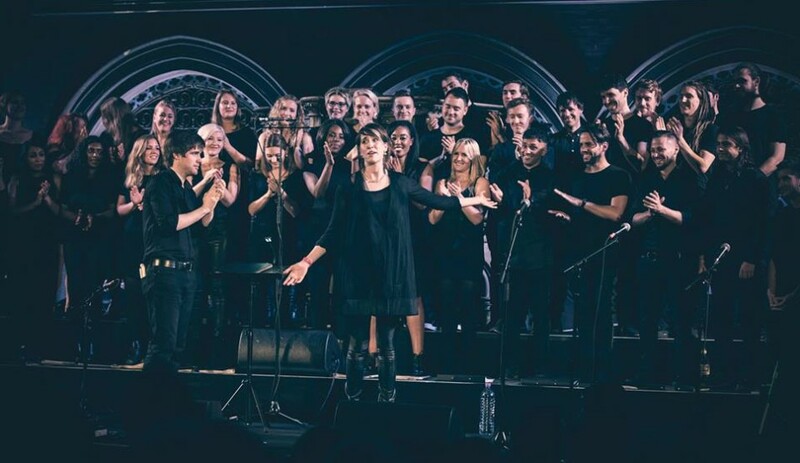 Being in the presence of a Grammy winner in an Islington chapel isn’t something that happens every day, which meant that the appearance of Imogen Heap on the bill at Oscilloscope, an evening of choral pyrotechnics at Union Chapel, set the tone for a incredibly special, soaring celebration of acoustic music and a capella. Union Chapel is such a beautiful venue that any performance taking place inside would be time well spent, but the LCV and Mahogany-hosted Oscilloscope was the perfect soundtrack for the late nineteenth century church’s vaulted ceilings and stained glass windows, all bathed in blue light for the evening. 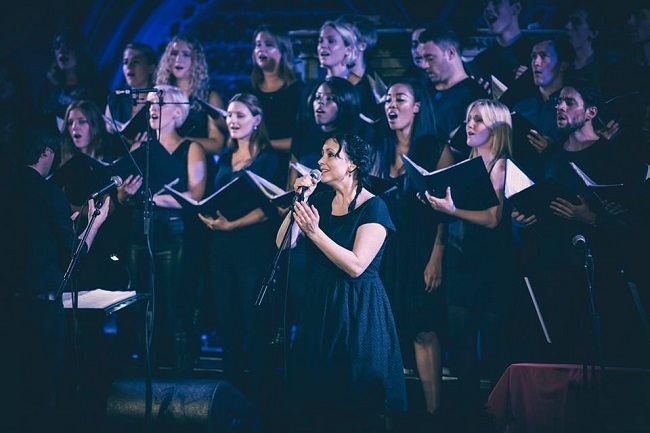 London Contemporary Voices (LCV) have history with Imogen Heap: the choir originally formed for a Royal Albert Hall show with the singer in 2010. 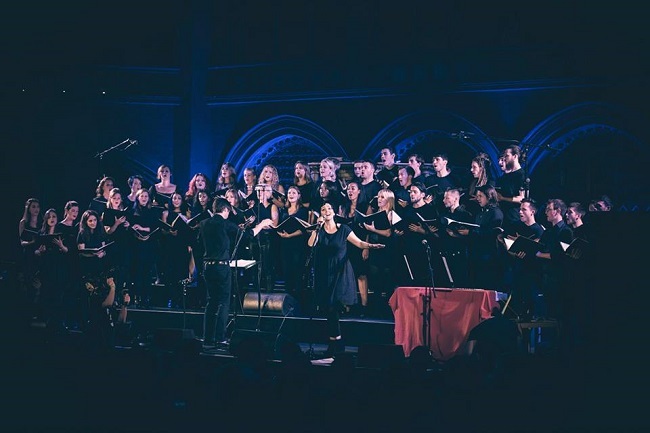 Since then, LCV has collaborated with the likes of Sam Smith and Laura Mvula and at Oscilloscope, these years of experience were evident, The 45-strong collective gave impressive, varied and (most importantly) sonically beautiful performances throughout the well-paced programme. That programme wasn’t what you would expect from an evening of choral music in a church: LCV and its sister choir, Kin, performed ‘Shatter’ with beatboxer Shlomo (I know, beatboxing, but Shlomo has worked with Björk and Damon Albarn and his vocal baselines were spectacular), a frenetic piece written especially for Oscillosope; Austrian musician Manu Delago performed with a Hang, a metal, UFO-shaped percussion instrument which seemed to be able to produce an infinite variety of steel drum-esque sounds; cello/acoustic guitar collective La Qualia enthralled with its cinematic, idiosyncratic music. 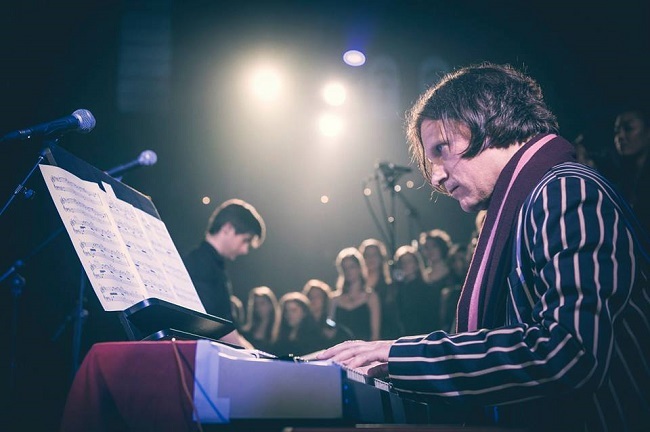 Show organiser Mahogany say they are led by ‘a love of unique performances in unusual spaces’ – I couldn’t sum up Oscilloscope better. The four things I took away from the night were the amazing range of sounds that can be produced with talented voices and barely any instruments, Heap’s intricate ‘Hide and Seek’ stuck in my head for the whole of the following week, the majesty of the chapel setting and that, as someone who equates choral music in churches with nodding off at Sunday mass, how exhilarating and beautiful it can be when you apply fierce creative might.